The Graco G3 Pro Pump from MotionSource is an automatic lubrication for Series Progressive and Injector-Based Systems. With its flexible design, the Graco G3 Pro Pump works with injector-based and series progressive systems. A cost-effective pump designed to serve multiple markets and applications, MotionSource is the Source for Graco G3 pumps. The Graco G3 Pro Pump has three controllers to choose from with multiple zone and feedback options. Standard configuration includes one adjustable pump element, plus room for two more. The ultimate in flexibility–for a high value, custom fit on your application. Not sure of what you need? Give our experts a call at 888-963-6686. We’re Graco trained and certified and recognized as the industry expert in Graco G3 Pro pumps. 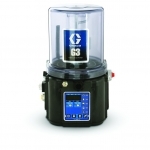 The Graco G3 Pro pump is available in 5 reservoir sizes. Below are the sizes and part numbers. If you just need technical help, give us a call 888-963-6686. All of our customer support team is Graco trained as well. MotionSource is your Source for Graco G3 Pro pumps!